Caught in pan trap placed underneath Larrea tridentata shrub. Your third image shows the linear pterostigma more clearly, suggesting this group. In your second image, you can also see the triangular shape of the pronotum laterally (also a diagnostic feature of the family). 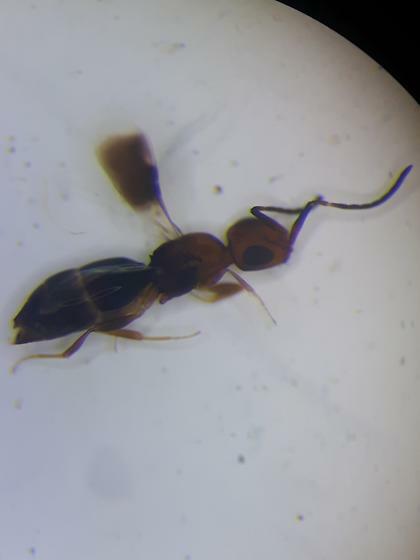 This looks to be a member of the Ceraphronoidea, which includes 2 families. The Megaspilidae have a semi-circular stigma, while the Ceraphronidae do not. Unfortunately the banding of the wing prevents me from seeing if this stigma is present or not. If you still have the specimen, you should be able to detect the absence/presence of the stigma by backlighting the wing. Thank you!! I added a close-up of the wing - I do not see a stigma. ... so it undoubtedly is a ceraphronid.